Momma Goose polished Baltic amber baby necklace in a baroque style. We call it MULTI BAROQUE. 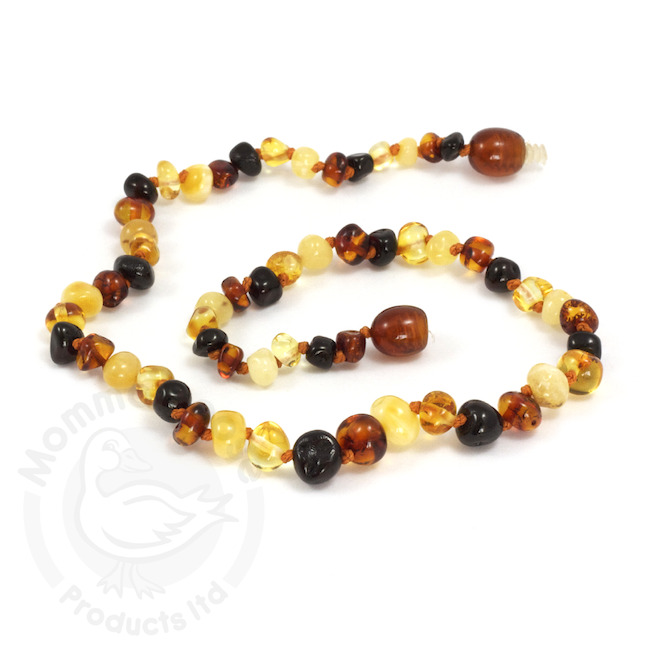 Mama Goose necklaces and bracelets are made with beads of genuine Baltic Amber from Lithuania. Amber is a tree resin that has been fossilized for millions of years. When worn against the skin, the skins warmth releases healing oils from the amber which contain succinic acid, a natural anti-inflammatory with analgesic effects. 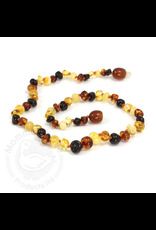 Historically, Baltic Amber has been used as a traditional remedy for many ailments, including inflammation associated with teething, arthritis, mastitis, joint and muscle pain. Do not leave baby unattended while wearing beads. Necklaces and bracelets are not intended to be chewed on. Protect your amber beads by removing them before exposure to chlorine, soaps, lotions, sunscreens, waxes or other residues, as these may coat the surface of the beads. Necklace should fit small enough that baby cannot move it up past the chin, but not so tight that it is uncomfortable.